I am absolutely obsessed with the indie line ILNP or "I Love Nail Polish". Barbra, the creator, has really pushed the limits on being unique, consistent, branded and just awesome. When she had to make the move from her original logo in round bottles to the new ILNP in square bottles, I didn't even mind THAT much because I love the brand. 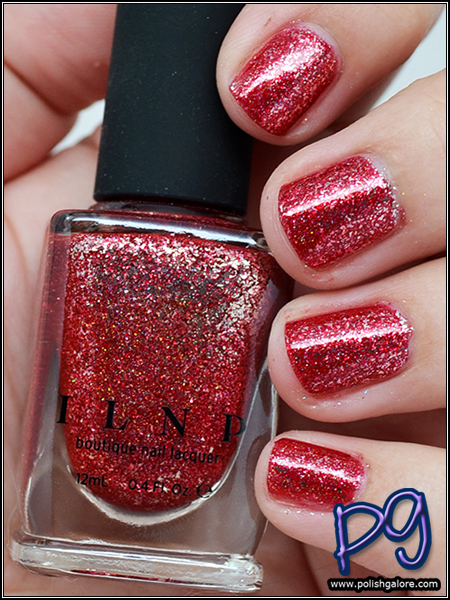 Today, in keeping with my 14 Days of Valentine's, I have ILNP Cherry Luxe from the Holiday 2015 collection. This is a really interesting red. So I have daylight light bulbs in my house and in my light box, but all I can really see in this photo is a cheery cherry red with some silver flakies. Sounds cool. This is from their "Ultra Metallics" line. I used a base coat of Duri Rejuvacote, 2 coats of polish, and finished with Glisten & Glow H K Girl top coat. 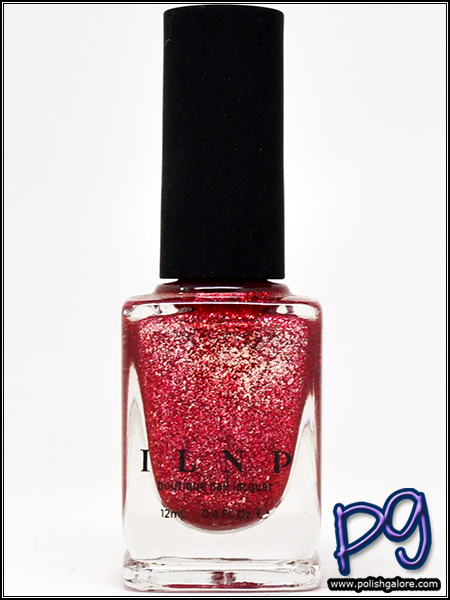 The polish dries smooth even though it looks like it would be gritty glitter - it's not. This is what I'm talking about when I say that ILNP is pushing the limits. This is from my light box. 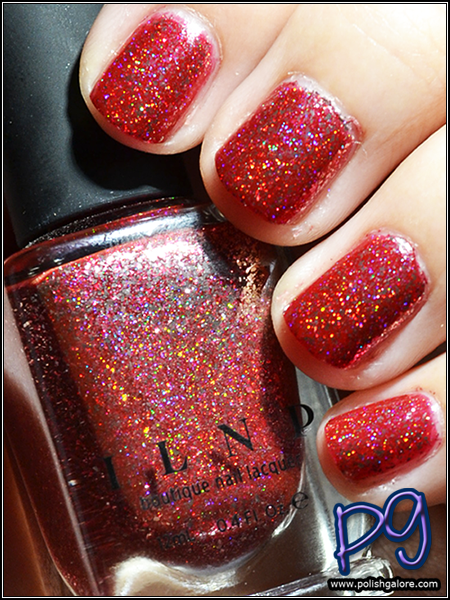 It almost reminds me of a candy cane - the red with silver metallic flakes. I love it and can definitely see myself wearing it around a lot. BUT THEN as I was about to take it off, I saw a flash of holo. YES HOLO! So I ran outside and sure enough, there is holographic magic in this bottle. So much goodness that my camera couldn't handle it. This photo was taken with my daylight light bulb desk lamp. You could have knocked me down with a feather. I'm so happy with this polish! The photos never do ILNP justice... as I was looking back on the website, there aren't many photos that really push the holo goodness - it's all about the metallic flakes.